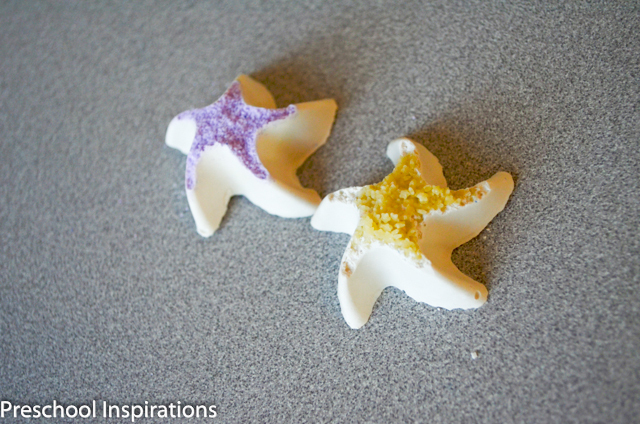 I love how beautiful and unique sea stars are! 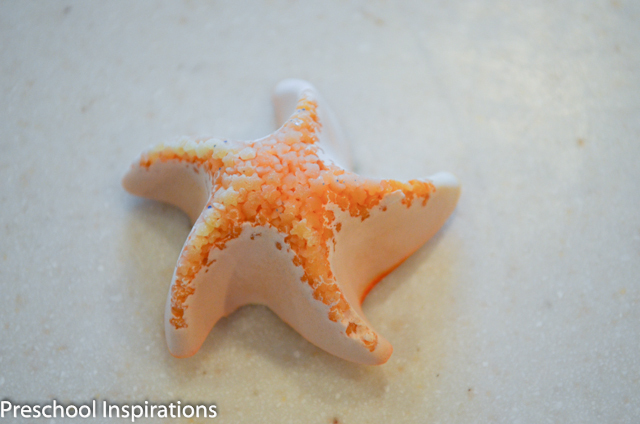 However, there are none close to me (besides the ones I brought back from beaches). 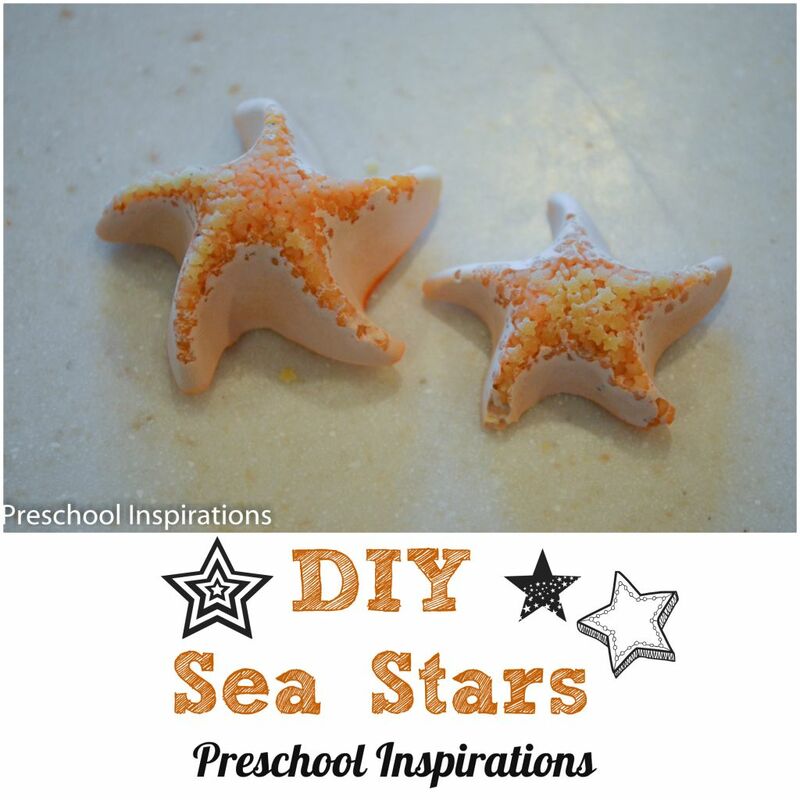 I decided to do an experiment with my preschool class to see if we could make our own sea stars. My main goals for this was to create a realistic structure that can withhold the abuse of preschoolers. I am thrilled to share that they fit the build! These have been dropped several times on the floor and still survived. 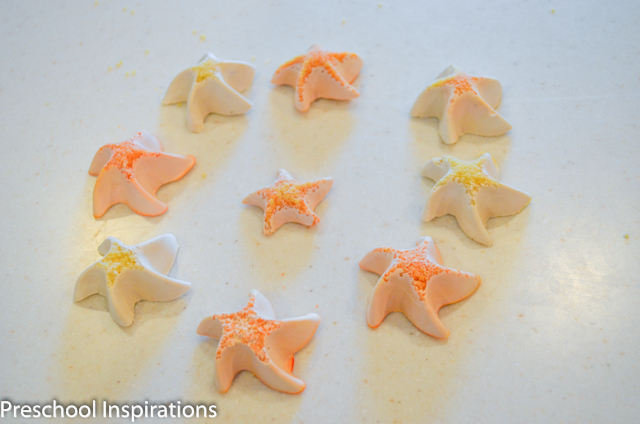 First, we decorated the inside of the sea star tray. I let the class decide between colored sand, pastina, or both. I bet glitter would look awesome too! 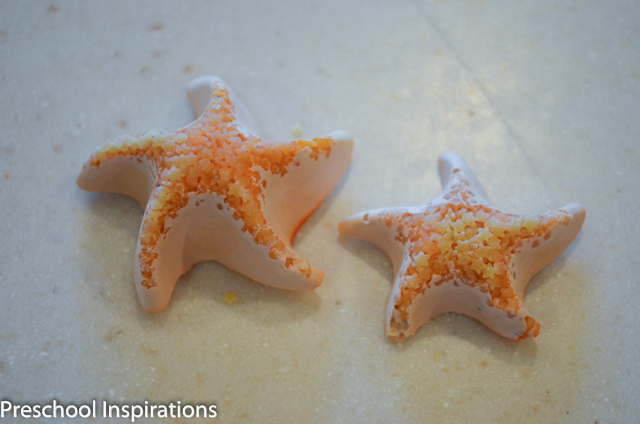 Once the decorations were pressed into the bottom of the sea star mold, we were ready to make our plaster. We mixed the Plaster of Paris (2 parts powder to 1 part water). 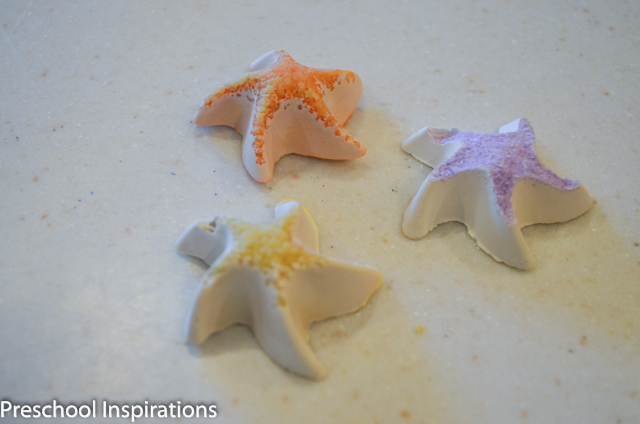 If you would like your sea stars to be colored, I recommend adding tempera paint to the Plaster of Paris. We added liquid watercolor to some, but it took quite a large amount and discolored over time. We quickly poured it into our mold and waited about an hour. Lastly, we popped them out and voila! I am so thrilled with how well these turned out and how unique each one is. The pastina fell out of one, but I think it only made it look even more realistic. 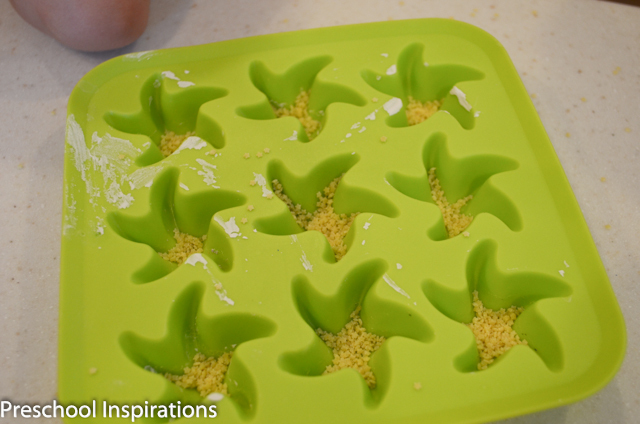 If IKEA was not an hour away, I would probably be stalking their ice cube tray selection to make more! What a neat idea! I love the addition of the pasta for texture. Thanks for sharing in the Discover & Explore linky. 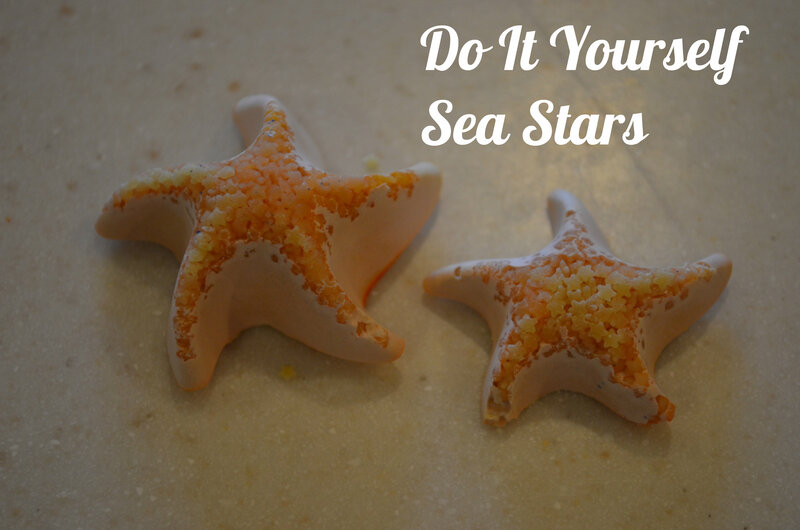 I’m featuring this post today. Thanks so much Shaunna! It was one of my most favorite projects, and all of the kiddos wanted to carry them with them all day. I am a huge fan of your website. It’s such an incredible resource!